NEW YORK — Did you know 45 percent of consumers under the age of 34 will do repeat business with LGBT-friendly companies? That is only a snippet of insight about the ongoing evolution of LGBT marketing that travel professionals received during the second-annual LGBT Tourism & Hospitality Symposium. The event was held in collaboration with the International Gay and Lesbian Travel Association (IGLTA) and was a part of the program of events during LGBT Week NYC. LGBT travelers in the U.S. alone spend approximately $75 billion per year, according to research from Community Marketing, Inc. Most destinations see the potential for the LGBT traveler positively affecting their destination and are catering to them. Las Vegas is just one example of a destination tapping into that potential and seeing results. Sin City has been promoting LGBT travel for more than 10 years. Events such as Temptation Sundays at Luxor, World Gay Rodeo Finals and Sin City Shootout — an annual LGBT sporting event — are just some of the signature events the city has to offer. "There's something for everyone coming to the destination," said Jim McMichael, specialty markets manager for Las Vegas Convention and Visitors Authority. The city uses both traditional and nontraditional advertising to promote LGBT travel in the city. It also uses the LGBT section of its website to advertise LGBT events and in turn allows the event to promote Las Vegas as a LGBT-friendly destination. "They are promoting us, we're promoting them," McMichael said. While Las Vegas has made a strong attempt to become the No.1 LGBT destination in North America, New York City has them beat. In NYC's first year of gay marriage, the economic impact was $259.5 million, according to NYC & Company. That was in 2011. Since then, New York has continued to cater to the LGBT market with its own LGBT tourism website to let visitors know that everyone is welcome. "As the most diverse and welcoming destination in the world, New York City embraces LGBT visitors year-round, but NYC's Pride celebration is a particularly exciting time to be in the City," NYC & Company CEO Fred Dixon said in a statement regarding the worldwide invitation to visitors for the 2016 pride celebration. "Whether it's in the West Village — the birthplace of the modern gay rights movement — Chelsea, Hell's Kitchen, the East Village, Williamsburg or Jackson Heights, we encourage visitors and residents to participate in the iconic and vibrant Pride events taking place throughout New York City this June and July." How can destinations promote to LGBT travelers? In its annual LGBT Tourism Survey, Community Marketing, Inc. found that 85 percent of gay and bisexual men, and 87 percent of lesbians and bisexual women respectively agreed that a tourism website should have both LGBT imagery throughout the site and also have a specific LGBT page of information. Destinations can also use targeted, programmatic banner advertising to target their message specifically to LGBT travelers. According to a case study presented by Spain Tourism, targeted banner ads allow "more specific targeting to reach individuals interested in resort travel, backpacking, urban exploring, etc." 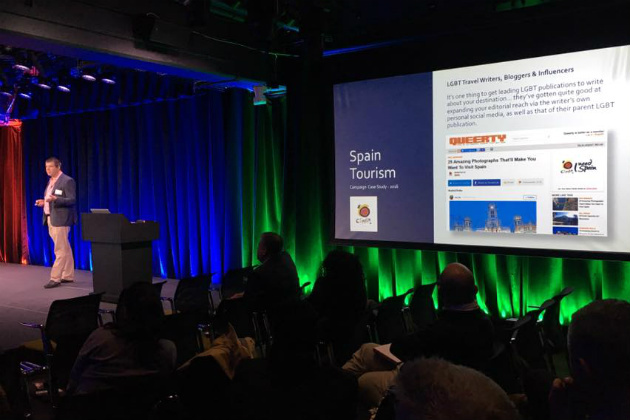 To obtain the desired result, Spain Tourism suggests advertising through platforms such as LGBT mobile apps, Facebook targeted advertising and expanding editorial outreach through LGBT travel writers, bloggers and influencers. It's not just destinations wanting to cater and market to the LGBT travelers. Brands are also looking to get in on the action. It is usually assumed that people who fall under the LGBT spectrum are looking for a destination that is LGBT friendly. Community Marketing, Inc. shows that is not always necessarily the case. When it comes to prioritizing between "LGBT-friendly" and "family-friendly," 65 percent of travelers will pick a brand that is more family-friendly. Still, hotel companies continue to evolve their brands to be LGBT-friendly. Hotel chain Marriott International recently announced a new campaign through its Marriott Rewards program to share an artistic expression of live in support of transgender lives. Through its #LoveTravels campaign, travelers can create artwork or handwritten messages to personally define their expression of love. The art installation will be unveiled before Capital Pride in June in Washington, D.C.
"Art is a universal language that evokes passion and spurs travel," said Stacey Milne, Vice President of Portfolio Marketing Strategy & Planning, Marriott International. "We want to see what #LoveTravels means to people all around the world by inviting them to share their artistic expressions of love, as one collective voice, this Pride season." Many brands are also catering to LGBT travelers by training staff on diversity and inclusion and providing an LGBT-friendly work environment for staff. "Diversity without inclusion leads to confusion," said Tyronne Stoudemire, Vice President, Global Diversity & Inclusion at Hyatt Corporation. Hyatt was the first major hospitality company to offer domestic partner benefits including sexual orientation and gender identity in its Equal Employment Policy. They also have diversity and inclusion training for staff with a list of best practices when interacting with travelers. LGBT Week NYC celebrates the achievements through travel, marketing and advertising when it comes to servicing the LGBT market. 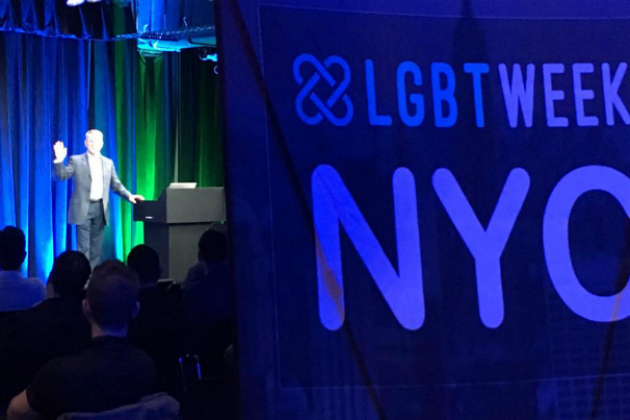 "We expanded our LGBT Marketing, Advertising & Technology conference from a one-day event to become part of something greater, LGBT Week NYC, as we had more folks wanting to attend than we had space for, and we had more high-quality speakers wanting to present than we had time for," said Matthew Skallerud of Pink Banana, one of the producers for LGBT Week NYC. "Opening up our conference to a week and working with partners in an 'open source' format, we've been able to create a mosaic of events and activities produced and hosted by various LGBT-dedicated organizations."